On 2 February, Egypt’s President Abdel Fattah el-Sisi held a cabinet meeting to review final preparations for his chairmanship of the African Union (AU) which begins on 10 February. As a founding member of the Organisation of African Unity, and chair in 1964, 1989 and 1993, Egypt is not new to such important continental roles. However this is the first time since the AU’s founding in 2002 that Egypt gets to steer the organisation’s affairs. It’s a significant development considering the frosty relationship in recent years between the AU and Egypt. In 2013, Egypt was suspended from the union following the political crisis in the country during the 2011 Arab Spring. The choice of priorities defines Egyptian interpretation of Africa’s current problem and what the country’s leadership thinks it can contribute. Egypt sees itself as having a background of national economic, social and structural reforms that have helped its development – and provide lessons for African countries on the same trajectory. Egypt has prioritised the promotion of intra-African trade as per Sisi’s statements at the Africa 2018 Forum at Sharm El-Sheikh in December 2018. 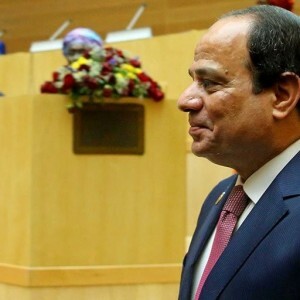 According to Sisi, Egypt was ‘keen on increasing its investments in Africa during 2018 by $1.2 billion to reach $10.2 billion’. It is also evident that the focus areas are shaped by Egypt’s own interests. On peace and security, for instance, Egypt’s priorities include pushing for the establishment of the AU Centre for Post-Conflict Reconstruction and Development in Cairo, and the launch of a high-level continental dialogue forum in Aswan, Egypt – the Aswan Forum for Peace and Sustainable Development. Notwithstanding the challenges, many North Africans have high expectations of Sisi’s 2019 leadership of the AU. According to the Egyptian foreign ministry, the country is keen to ‘achieve tangible results’. Even though the chairman has considerable power to influence the AU’s agenda, overall change requires action from the entire institution, not the chairman alone.